Abstract：Fat and fatty acids in elderly formula milk powder on Chinese market were analyzed. The results showed that the content of fat in surveyed elderly formula milk powder was 12.5-25 g/100 g, and the energy ratio was 27.4%-45.6%; and the main fatty acids were myristic acid (1.56%-1016%), palmitic acid (14.05%-42.09%), stearic acid (5.10%-12.64%), oleic acid (2159%-42.00%), linoleic acid (3.48%-18.11%) and α-linolenic acid （0.20%- 3.92%）. Both the energy ratio of fat and the ratio of different types of fatty acids in elderly formula milk powder did not match the Chinese dietary reference intakes. \[1\] 许雨玥. 中国人口老龄化影响及对策研究\[J\]. 现代经济信息, 2016（2）: 12，14. \[2\] CESA S, CASADEI M A, CERRETO F, et al. Influence of fat extraction methods on the peroxide value in infant formulas\[J\]. Food Res Int, 2012, 48(2): 584-591. \[3\] FIELD C J, ANGEL A, CLANDININ M T. Relationship of diet to the fatty acid composition of human adipose tissue structural and stored lipids\[J\]. Am J Clin Nutr, 1985, 42(6): 1206-1220. \[4\] SIMOPOULOS A P. Essential fatty acids in health and chronic disease\[J\]. Am J Clin Nutr, 1999, 70(3S): 560S-569S. \[5\] GONG Q, ZHU P, ZHANG B, et al. Safety and efficacy of n-3 fatty acid-based parenteral nutrition in patients with obstructive jaundice: a propensity-matched study\[J\]. Eur J Clin Nutr, 2018, 72: 1159-1166. \[6\] BECKER N, ILLINGWORTH D R, ALAUPOVIC P, et al. Effects of saturated, monounsaturated, and omega-6 polyunsaturated fatty acids on plasma lipids, lipoproteins, and apoproteins in humans\[J\]. Am J Clin Nutr, 1983, 37(3): 355-360. \[7\] VEERMAN J L. Dietary fats: a new look at old data challenges established wisdom\[J\]. BMJ, 2016, 353: 1-2. \[8\] 鲁丽, 刘赫. 脂肪肝、脂代谢紊乱与糖尿病及其临床对策\[J\]. 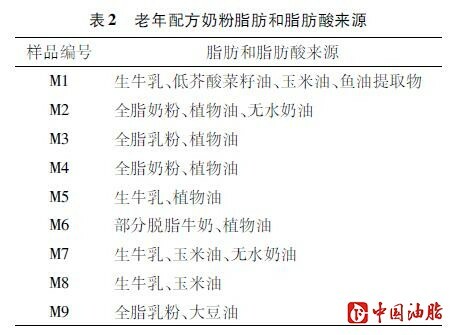 实用糖尿病杂志, 2015(1): 6-7. \[9\] 中国营养学会. 中国居民膳食营养素参考摄入量 \[M\]. 北京：中国轻工业出版社, 2014. \[10\] FAO. Fats and fatty acids in human nutrition: report of an expert consultation: 10-14 November 2008, Geneva \[M\]. Italy Rome: Food and Agriculture Organization of the United Nations, 2010. \[11\] 钱叶芳. 成年人脂肪肝与血脂水平、体重指数的相关性分析\[J\]. 现代诊断与治疗, 2013, 24(6): 1356-1357. \[12\] 朱静芬, 施榕. 膳食脂肪含量与2型糖尿病的发病风险\[J\]. 上海交通大学学报, 2005, 25(6): 643-646. \[13\] 欧阳雁丽, 王瑞淑. 菜籽油芥酸含量对大鼠肾上腺、心脏和生长的影响\[J\]. 现代预防医学, 1989(3): 1-6. \[14\] 卢跃鹏, 金绍明, 江小明, 等. 部分省份食用植物油中脂肪酸氯丙醇酯含量水平调查分析\[J\]. 中国油脂, 2015, 40(11): 79-84. \[15\] 王月华, 孙冬梅, 温江涛, 等. 玉米油生产过程中对玉米赤霉烯酮及呕吐毒素的影响\[J\]. 粮食与食品工业, 2015, 22(4): 19-22.